Last Tuesday a client asked me unscramble her family research. There were conflicting dates, names, ages, occupations, etc. The culprit...her census record interpretations and analysis from 1850 - 1930. Accurate analysis and conflict resolutions are key to properly identifying your ancestor and creating their life story. Once we pull various census records to identify family units and rectify dates, we can further utilize these enumerations to assist in creating a family snapshot. Certified Genealogist Sharon Tate Moody penned an Take care when relying on census records for the Tampa Bay Online TBO.com 10 July 2011 that outlines the pitfalls of poor census analysis of occupations. Was your 1880 ancestor John Morris the blacksmith, or John Morris the teamster? We often follow occupations to distinguish or link persons with common names. Family researchers often fail to consider the background and purpose of each census. There are purposeful changes from one census form to the next. Each carry distinct emphasis that can be uncovered through the census taker's directions. Explicit instructions were given. Answers carried a heavy load. They may have reflected a social influence or just a lack of understanding a question. 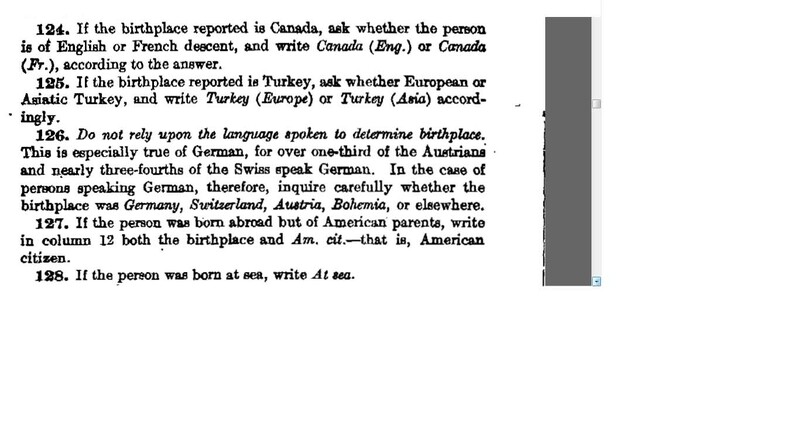 Why might your ancestor be marked as naturalized in 1910, but recorded as an alien in 1920? The researcher should not just cast aside this discrepancy. The language of yesteryear must also be taken into account. A teamster of today is not a teamster of oxen and animals of yesterday. Sharon Moody gives a great example of a mechanic. Census records are a great launching point for your research. But with its error-filled enumerations, genealogists must expect discrepancies. Using Genealogical Proof Standard (GPS) the researcher must support and provide sound reasoning for their final determination. Uncle Joe could not have been born in 3 different years.